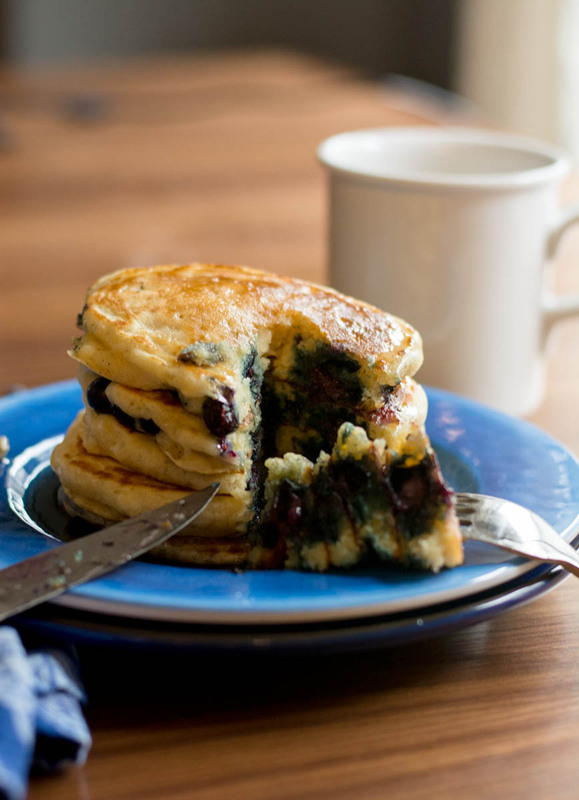 Weekends are for sleeping in, hanging out in your pj’s, riding bikes, and making these pancakes! 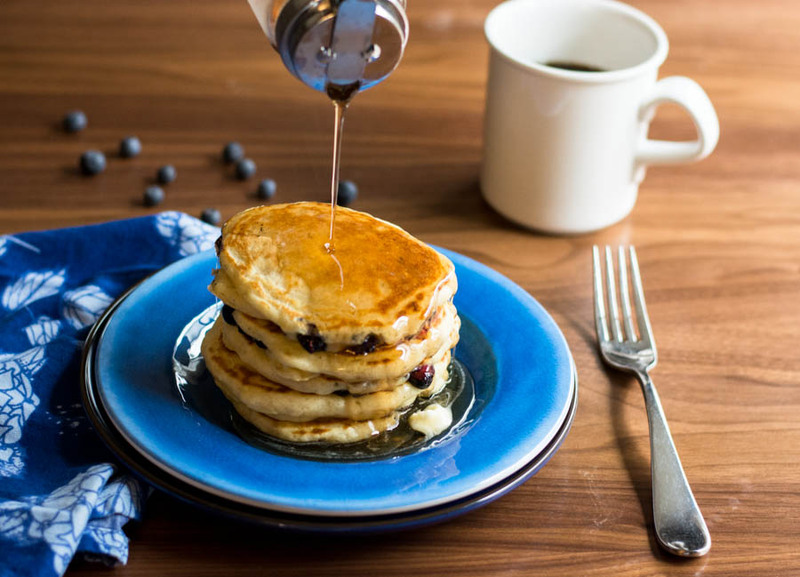 Fresh blueberries and buttermilk, all in a plate full of pancakes drenched in maple syrup….what’s not to love? Pancakes and I have recently been re-acquainted, when I was little I was not a pancake fan. Give me waffles anyday, but not pancakes. I blame this on my mom and grandma. Mom used to make pancakes from a yellow box called bisquick, and served them with that syrup shaped like a lady in a apron, yes Mrs Buttersworth. They called that syrup back in the day. Love my mom for trying but they were tasteless, and that “syrup” was thick and sugary. Ugh! Then for some strange reason that I still cannot figure out to this day, my grandma would make these “taco pancakes”. I’m sure there is a Portlandia episode somewhere about this weird dish! My mother and I would go to grandma’s house for dinner mid-week a few times a month, and these were served what seemed like every time we went! I’m sure that was not the case, but when serving this awful dish to an 8 yr old, that’s all I could remember about those dinners! So the dish went like these, pancakes topped with meat taco mixture, then tomatoes, sour cream, green onions and cheese. What the heck was this? Those two pancake experiences ruined any kind of pancake liking for me as a child! 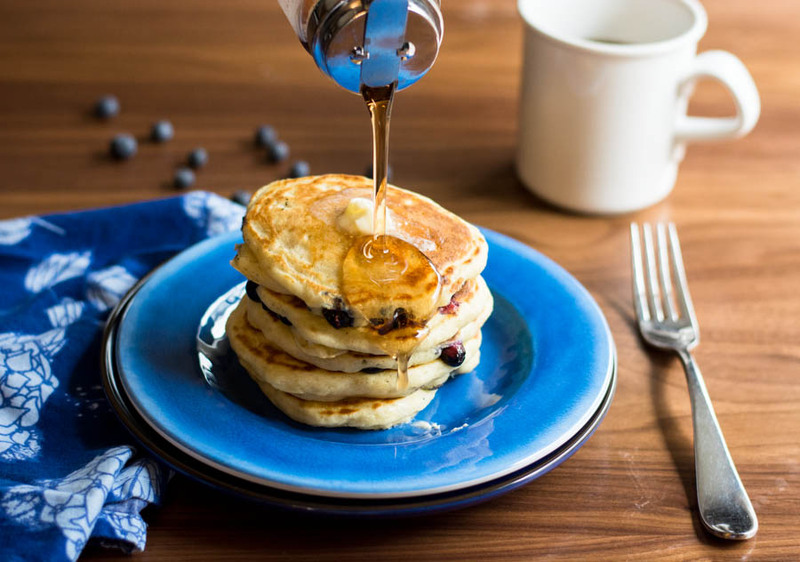 As I got older and had two kids of my own, I wanted to make them pancakes…and not from a yellow box! I tried so many variations and none ever turned out. They were either doughy in the middle, or overdone and dry. I couldn’t figure out what the hell I was doing wrong. I could however, make some awesome waffles! It wasn’t until recently I figured out the problem. I needed a griddle. I really believe this was the problem all along. Andrew bought a griddle knowing how much I wanted to master the pancake, and he whipped up the first batch of blueberry pancakes. They were AMAZING! Perfectly brown and done all the way thru, and not dry at all! I was in love with pancakes! Almost every weekend we have pancakes at least once. 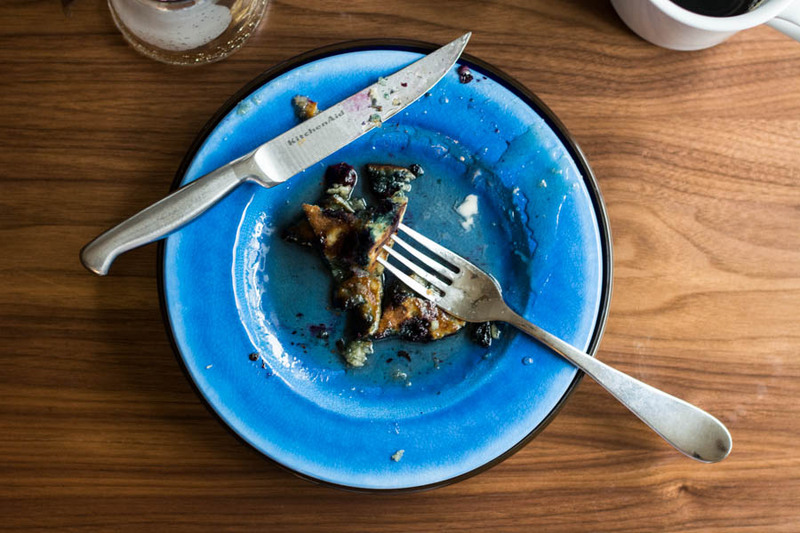 Blueberries are my favorite, but you could adpat this recipe to almost any flavor. And for the syrup- we always make our own. It takes about 10 minutes. Sugar, water, and maple flavor on the stove, and voila- the best tasting syrup you will ever have. All of my daughter’s friends request a breakfast that has syrup involved when they stay the night. Heat a large griddle to medium high. In a separate bowl, whisk together the buttermilk, eggs, vanilla and melted butter. Add the dry to the wet and stir with a spatula until mixed. Let batter rest for a few minutes, it will thicken, If batter is to thick, then add a few drops of water and mix. 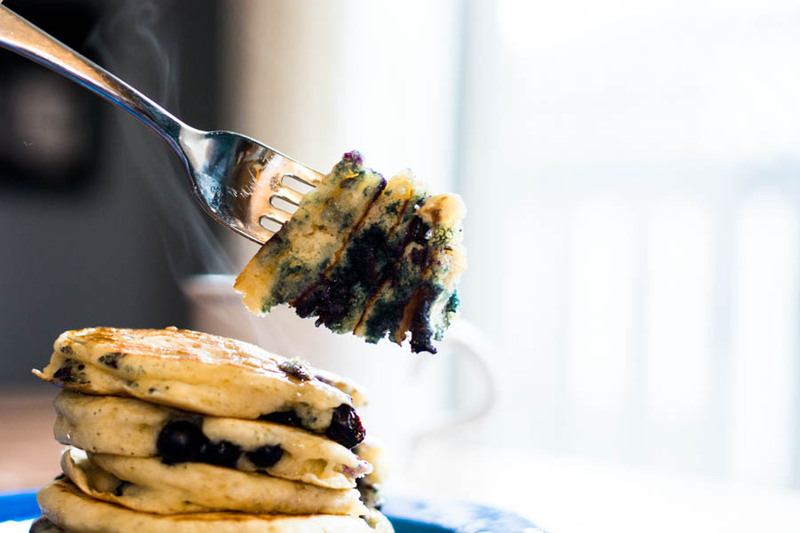 With a 1/4 C measure cup, pour batter onto hot griddle, immediately sprinkle blueberries onto pancakes on the grill. This method prevents the berries from bleeding into the batter and helps keep the berries whole. 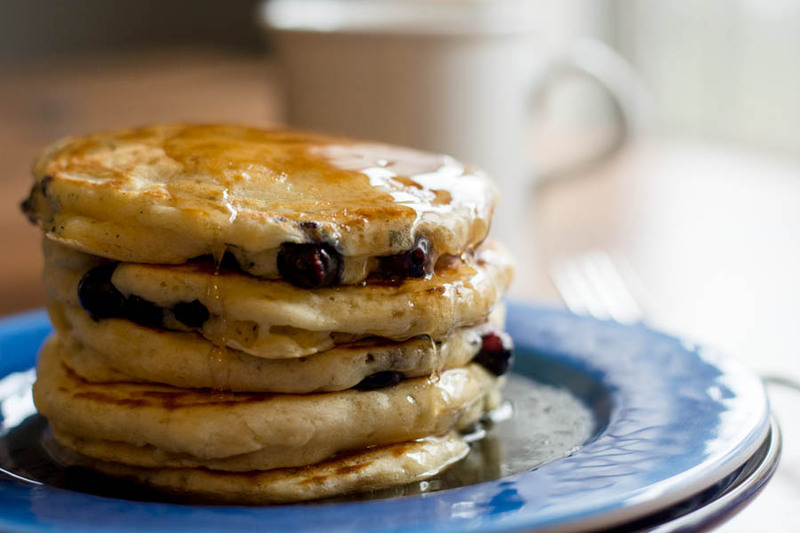 Flip pancakes after 3-4 minutes, or until golden brown. these look delicious! 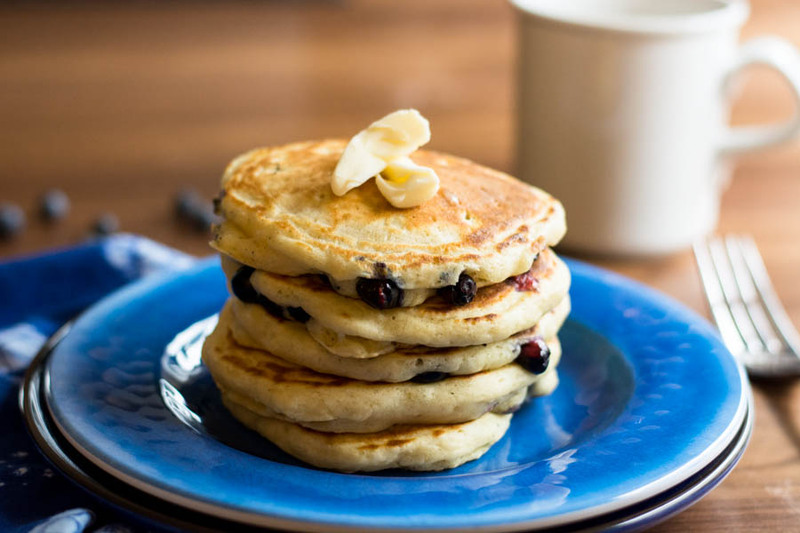 we love pancakes so I’m definitely going to try this recipe. 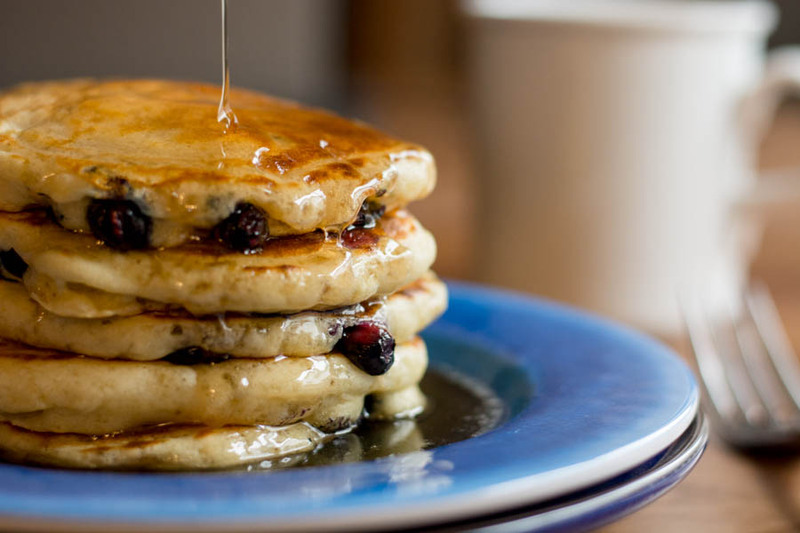 Some good pancakes can make a whole day better! Yay to griddles!